Mr Trump tweeted that Prince Mohammed had spoken to him on the phone. 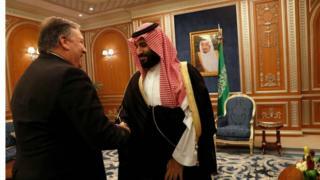 Unnamed Turkish officials say Monday’s search of the Istanbul Saudi consulate has turned up more evidence Mr Khashoggi was killed there. Mr Trump tweeted that he “totally denied any knowledge of what took place in their Turkish Consulate”. The focus has expanded from the Istanbul consulate to a search of the consul’s residence, some 200 metres away. The consul, Mohammad al-Otaibi, left Turkey on a commercial flight bound for Saudi Arabia, hours before Turkish police were due to enter the building on Tuesday.